The US economy continues to chug along, but what might bring this bull down? Chris Puplava, Chief Investment Officer for Financial Sense Wealth Management, says to watch foreign markets, inflation, and the Fed. There are two big catalysts that could push equities into correction mode later this year. The coming blackout period for stock buybacks during the Q2 reporting season, which is going to be kicking off this week and next week, could constrain markets, as the end of record corporate buybacks are slated to take some liquidity out of the markets. Also, the Fed is ramping up its balance sheet reduction to the tune of $30 million a month, then $40 million a month this quarter, and eventually ramping up to $50 million beginning Q4, meaning even more liquidity is slated to be drained from markets. 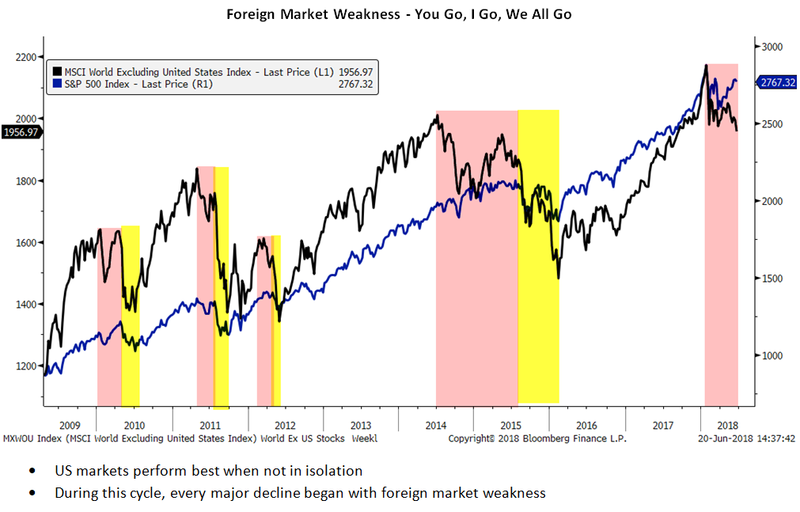 The US is still strong now, and Puplava isn’t calling for an end to the bull market yet, but we also need to note the stress in emerging markets. We may be looking at a “and then there was one, and then there were none,” scenario, with the US market being the last to roll over. Puplava isn’t looking for an end to the bull market yet. More often than not, he noted, bear markets occur in the context of a recession with the consumer retrenching, corporate earnings declining, unemployment claims rising, and the economy as a whole taking a step back. We aren't seeing any of those things right now, Puplava said. However, looking forward, inflationary pressures are likely to continue, which will lead to further rate increases, higher borrowing costs, and, ultimately an economic slowdown.